Сейчас вы просматриваете новость Nikon Capture NX2 2.4.6 (Mac OS X) :February.10,2014, данная новость входит в категорию Софт в которой вы сможете найти все по теме данного материала. Capture NX 2 easy-to-use software lets you make intuitive photo enhancements which are immediately visible on your monitor. Simply place the Control Point on the area that you want to edit and U Point Technology will analyze color elements such as hue, saturation and brightness, as well as recognize similar areas where an edit would best be applied.This technology powers the entire Capture NX 2 series of Control Points: Color Control Points, the all-new Selection Control Points, White/Black/Neutral Control Points and Red-Eye Control Points. With Capture NX 2, there's no need to deal with selection tools, layers or lengthy training. Tool Color Control Point ( Point Color Management ) : Operate shade, brightness and saturation , color control point placed on the image, and then just adjusting the length of the sliders. Unsharp Mask ( unsharp mask ) or D-Lighting function to a specific area of ? ?an image with one click. No need for precision selection or masks - the recognition of areas requiring changes automatically. Tool Auto Retouch Brush ( Brush Auto Touch ): For taking pictures with a more natural tool Auto Retouch Brush ( Brush Auto Touch ) lets you remove specks of dust produced in the image when shooting , just click and brush stroke . * This impressive software allows a new generation to use their full creative potential for processing and image editing Nikon. Thanks to the exclusive technology U PointTM Capture NX2 includes a large number of powerful tools and four fully customizable workspaces with the ability to save and switch between them for quick and effective work . Simple and intuitive to work Capture NX2 software enables not concentrate on working with tone and color processing images according to the classical principles of focusing and the allocation of certain areas of the image . 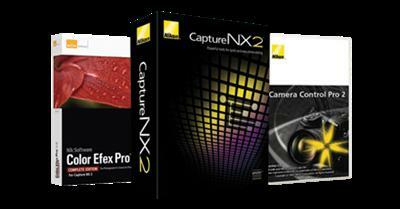 Capture NX2 - this is the best product designed for editing files Nikon NEF. * The new package is introduced not so much a new concept or types of editing , but simply rendered in a comfortable place already existing functions . * Photo Management ( Picture Control ) : a set of different labels that use XMP and IPTC standards make it easy to tag and sort images. * Ability to work on two monitors : allows you to extend your workspace when you install two monitors. * Image format JPEG ( compatible with Exif 2.2-2.3). * Image formats: RAW (NEF, NRW), MPO (3D) and TIFF (RGB), video clips , sound files , reference images for the function " Dusting " and log data GPS, recorded with a digital camera Nikon. * Image formats: RAW (NEF, NRW), TIFF (RGB) and JPEG (RGB), as well as video formats MOV, AVI, MPEG1 and WMV, saved using application software Nikon. * Added support for image format RAW, taken by camera D3300. However, this option is only supported image format RAW, obtained with the following cameras.
? D7000 camera and later models of digital SLR cameras.
? advanced camera with interchangeable lenses .
? Cameras COOLPIX A, COOLPIX P7100, as well as later models of cameras COOLPIX, which support recording format NRW *. * Dropped support for Mac OS X, version 10.6 . * Fixed a problem in that the image files edited and saved on a disk with FAT32, the data retained without editing. Nikon has released Capture NX version 2.4.6. The latest update adds Raw image support for the recently announced entry-level D3300 and the improved white balance adjustment options can now match the 'Auto 1 ' setting found in newer DSLR and Coolpix cameras. Version 2.4.6 also expands Fine Adjustment range from 4132 -7042k to 2500 -7042k when using the Direct Sunlight option for Daylight. * Support for RAW images captured with the D3300 has been added. * Advanced settings, such as Sharpening, under Camera Settings> Picture Control in the Develop section of the Edit List palette can now be adjusted, even when Unchanged is selected for Picture Control when RAW images are opened. * The following modifications and additions have been applied to White Balance> New WB in the Camera Settings portion of the Develop section in the Edit List palette. * An Auto 1 option has been added to White Balance> New WB options. Capture NX 2 adjusts white balance for colors similar to those achieved in images captured with a camera's Auto 1 (Normal) * white balance setting.
? However, only RAW images captured with the following cameras are supported.
? The D7000 and later digital SLR cameras.
? Advanced cameras with interchangeable lenses.
? The COOLPIX A as well as the COOLPIX P7100 and later COOLPIX cameras that support recording in the NRW format. * Auto white balance setting with cameras that do not offer an Auto 2 (Keep warm lighting colors) option.
? Adjustment units available with the Tint option have been changed from 1 to 0.01 for more precise specification.
? The adjustment range for Fine Adjustment when Direct sunlight is selected for Daylight has been expanded from 4132 -7042k to 2500 -7042k.
? Adjustment using Fine Adjustment and Tint is now possible when Recorded Value, Auto 1 , Auto 2 , or Underwater is selected. * When image files saved to a disk formatted using the FAT32 architecture were edited and saved, editing details were not applied. * Support for Mac OS X version 10.6 has been eliminated. APlease note: Capture NX 2 is not compatible with the Case Sensitive or Case Sensitive, Journaled disk formats. AKVIS All Plugins 2013 Multilingual Update 04.11.2013!1!